Clifford Mohr always said her maiden name was Lÿkke, but that doesn’t seem right. 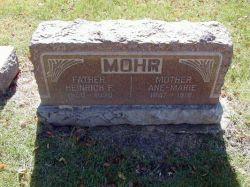 Her death certificate lists her father’s name as Anders Sorensen, Thorwald Mohr’s Christening certificate lists her name as Sorensen, and the California Death Index entries for two of her daughters (Frances and Dagmar) each give her maiden name as Sorensen as well. Other records all support this: birth records of her other children, danish census, marriage, and finally her birth record! It seems her father had the tilnavn Lÿkke, but such names are not usually passed on to daughters. According to the Dansk Data Arkiv Emigration Database, Ane registered for emigration on 17 Oct 1894. Her last residence was in Kobenhavn and her destination was Chicago. She departed through a foreign port. [S389] Church books for Solbjerg parish, Kirkebøger 1814-1848. [S187] Death Certificate of Anna M. Mohr. [S1185] 1850 Danish Census (Folketælling) - Household of Anders Sørensen Lyk [Lÿkke], Statens Arkiv: Dansk Data Arkiv. [S1186] 1855 Danish Census (Folketælling) - Household of Søren Andersen Lÿkke, Statens Arkiv. [S1187] 1860 Danish Census (Folketælling) - Household of Søren Andersen Lyk [Lÿkke], Statens Arkiv. 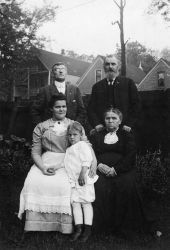 [S126] Database of Illinois Death Certificates, 1916-1950, Illinois State Archives & Illinois State Genealogical Society, Certificate # 6017303.